The RT Booklovers Convention is just around the corner and Rayna over at Naughty Editions has already scoped out the Hyatt. I’m still hoping that I’ll be able to show up on Saturday for the massive book fair since it’s only 4 hours away, but we’ll have to see. All Things Urban Fantasy has found the cover for Becca Fitzpatrick’s Crescendo, the follow up to Hush, Hush. 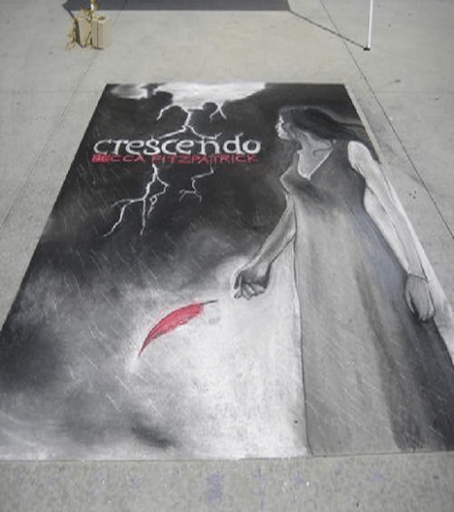 The cover reveal was actual done at the Denver Teen Lit Festival via sidewalk chalk by Laurie Maves, which in itself is fabulous. I have to say, I love this cover. Especially the red feather. Crescendo comes out November 16, 2010. The Book Smugglers have kicked off the second edition of their Steampunk Appreciation Week. Suvudu would like to remind everyone that Neil Gaiman will be speaking, both in person and online, tonight from 6-8pm EST in celebration of National Library Week. There will be a video streaming the live event and if you want to ask Neil a question, just hit up gaimanatjcpl.org. All Things Urban Fantasy is looking for reader questions for her upcoming author interviews that will occur during her Paranormal Summer Fest in June. Abigail has a ton of authors planned, so head on over to see who will be there and to submit any questions. Jeaniene Frost advises that for the next two weeks, Wicked Lovely, the first book in Melissa Marr’s series, is available as free ebook on Barnes & Noble and Amazon – I’ve already gotten my copy! Jennifer Estep has two short stories frrom her Elemental Assassin’s series – Web of Death takes place in between the events of Spider’s Bite and Web of Lies and focuses on what hap­pens when Gin gets some unex­pected vis­i­tors one night and Web of Deceit is another pre­quel story about Gin’s first solo job as the Spi­der when she was a teenager and is told from Fletcher Lane’s point of view. Yeah, that’s all you’re getting because there’s that many great stuff and Doug says it soo much better than me. Make sure you check out his Weekend Report. Yasmine Galenorn is giving away a copy of Night Myst via Twitter. Contest ends April 13th. Must enter via Twitter: Send me an @ reply w/hashtag #NightMyst & why you want to read the book early. Entry: ONE TWEET ONLY. You: over 18. Michelle Rowel is giving away a copy of Larissa Ione’s Ecstasy Unveiled. Contest ends April 13th. It’s Dark in the Dark and Patricia’s Vampire Notes are each giving away three copies of Stephenie Meyer’s The Host. Contests end April 30th and the 27th respectively.